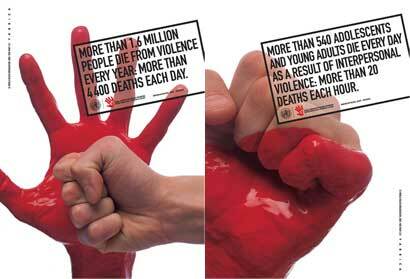 An international advertising campaign, commissioned by the World Health Organization (WHO), highlighting the problem of violence in its most intimate manifestations, which are difficult to disclose and fight: group violence, self-inflicted violence, sexual violence, violence against a partner, youth violence, abuse of the elderly and abuse and abandonment of children. The campaign was presented at an international health conference in May 2003 and was distributed worldwide in several languages. It was used to increase public awareness on the problem of violence, which can and must be prevented all over the world.